The Crescent Sleigh Bed is simply one of the best Amish made beds you can buy. Legs are squared and strong, the scrolled footboard curves gracefully and the headboard completes the beloved look of a sleigh with its rounded top rail and display of fine wood. The solid structure of an Amish sleigh bed makes it a lovely candidate to take center stage in a master bedroom. 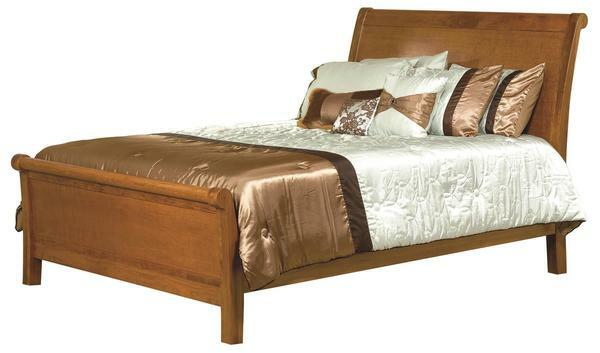 The sleigh bed style is one to be showcased and enjoyed. If you have any questions about the options, construction or shipping of your new Amish Crescent Sleigh Bed, please contact us by phone or email. Our team of Furniture Specialists can answer all of your questions and offer helpful advice. DutchCrafters is the leading internet retailer of Amish furniture and you can rely on a quality product to serve your family for years to come. Thank you for shopping with DutchCrafters.